The Kaprun inferno - at one of Austria's most popular ski resorts - was the country's worst fire since World War II. On the morning of 11 November 2000, 167 men, women and children boarded a funicular train that should have taken them to the Kitzsteinhorn glacier. 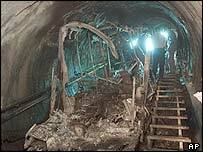 But 155 of them died in the blaze, in a tunnel high above the town of Kaprun. Most of the victims choked to death as they fled uphill to escape the blaze, which reached 1,000C. "I did not realise the full extent of the catastrophe until two railway workers came directly from the tunnel... All they had found was the metal base of the train," regional governor Franz Schausberger said at the time. The fire broke out while the single-carriage train packed with skiers was entering the 3.2km tunnel. The blaze acted like a giant chimney, sucking oxygen in from the bottom and sending toxic smoke billowing upwards. More than 200 rescuers tried to reach the train, but their efforts were thwarted the heavy smoke. The 12 people who managed to escape broke out of the back of the train. One survivor told Austrian media: "My only thought was to get out. "I was able to save myself at the last moment because a window was kicked in and I could fight my way outside." 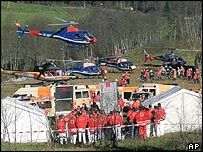 Rescuers worked in short bursts of 90 minutes because of the physically and psychologically gruelling conditions. The policeman leading the rescue operation, Franz Lang, said the force of the fire was so great "we had to cut out, to dissect each victim". Emergency workers said they saw melted rubber from ski-boots on the metal rungs of escape ladders. In most cases, identification required DNA tests. Among the dead were skiers from Austria, Germany, Japan, the US, Slovenia, the Netherlands, Britain and the Czech Republic. Thirty-seven of the victims were under the age of 20. It was an international disaster, but it was also very local tragedy. Thirty-two of the victims were from the nearby town of Wels, while in Kaprun, candles were lit in shop windows. Austria observed two days of national mourning. "We are all shaken," Chancellor Wolfgang Schuessel told a memorial service. "All of Austria is in mourning."